These 4 wheeled vans were two of literally hundreds of identical vans built to a standard BR design at Earlstown in 1960. Built to passenger train standards and often ran attached to such trains to provide extra parcels and luggage space. They were a common sight all over the rail system, eventually replacing the whole selection of earlier van design (such as BZ 70654E). Until the 1980s they were seen carrying all manner of traffic, from newspapers to cars. The final few ended their days in the Manchester area in the late eighties. RVP purchased three in 1983 and they were moved to Loughborough. They were never intended to be restored and were for use as storage space for spare parts. Moved to Rothley in 1993 they continue to be used for storage space. However we are now clearing much of our stock of spares, so intiially one (94125) has been sold, to be followed by 94606 in due course. The third (94707 - pictured) will remain in use for the time being, and is likely to be restored in due course to run with the mail train. 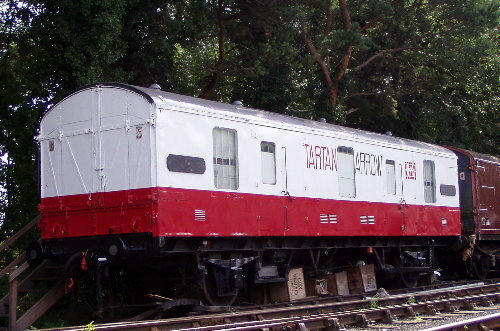 For the time being it is in use as a workshop and received a cosmetic restoration in 2006 to "Tartan Arrow" livery. This livery was carried by a few of these vehicles in the late 1960's for use on high speed parcels services between London and Scotland. It is believed to be the only preserved vehicle carrying this eyecatching and otherwise forgotten livery. A fourth CCT (94286) is owned by a member and is used regularly on GCR trains to carry a large water tank for fighting lineside fires.